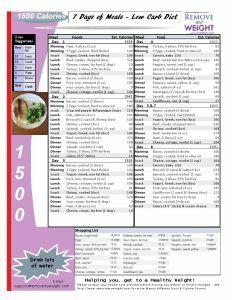 You should try this simple 1500 calorie menu plan, almost completely based off of the Low Carb Diet, which is especially recommended if you have any blood sugar issues and are wanting to reduce or eliminate things that go with type 2 diabetes. It is a comprehensive menu plan helps you take the next step, by focusing on vegetables and your proteins. This gradually helps you lose weight, on average, 1 lb. every 3 days. While adjusting to a new way of eating your body is learning to keep off body fat at the same time as reducing the high GI carbs, as a result, you are getting you closer to your ideal weight daily. Most people find it’s beneficial to supplement your diet with 30 minutes of walking daily. Most of all, you should drink lots of water with any diet program. The Low Carb Diet is a progressive diet structured around natural proteins. Its effectiveness is known worldwide as it centers around natural foods that supply the body with necessary nutrients, introduced in a timely manner. For a lot of our readers, it is the preferred diet as you are allowed to eat freely but in a conscientious way, making dieting an effective and sometimes even enjoyable experience. Download your 1500 calorie Menu Plan now, or try these variations. For those who are currently already below 200 pounds, going to the 1200 Calorie Diet plan may be right for you. We add new menus to this site weekly. Please sign up for our newsletter and get a free menu to continue getting free menus every week.